Vitamin-rich foods like leafy greens and fruits are essential to one’s diet because they boost the immune system and will fight off illnesses. 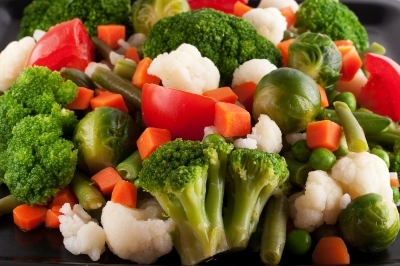 These foods tend to have a lower calorie count, which makes for healthy eating. Vegetables and fruits are also rich in fiber, which allows food to pass through the digestive system easily and can combat stomach illnesses and colon cancer. Fish and nuts packed with omega-3 fatty acids can sharpen a person’s mind and stave off mental illnesses like Alzheimer’s disease. Calcium is essential for bone health and about 1,000 mg of calcium should be consumed daily; recommended foods include tofu, broccoli, milk and cheese. Adults over 50 should also consume a decent amount of protein for healthy muscles. Protein can be found in a variety of fish, poultry, eggs, beans and seeds. As always, always drink enough water every day. Older adults tend to become dehydrated more easily than their younger counterparts so it is recommended to drink water throughout the day. Drinking enough water will help you avoid urinary tract infections and constipation. To learn more on improving your diet and digestive health, contact San Francisco Gastroenterology.